Notre Dame Fans (in South Bend ONLY) are one of the best. I’ve encountered more than my share of obnoxious fans of the Irish in my life, so assumed they’d all assemble here for games. I couldn’t have been more wrong. Before, during, and after the game fans were friendly and welcoming. “Good luck today, but not too much!” “Congrats on a great game.” Nothing but class. Reminded me a lot of the Virginia Tech fans. The Notre Dame pre-game experience is ABSOLUTELY the best. They print a brochure of game day activities just for each game. It includes an amazing array of activities – yoga, concerts by the bagpipers, glee club, band, etc. My personal favorite – they have a program of lectures (Saturday Scholars)! 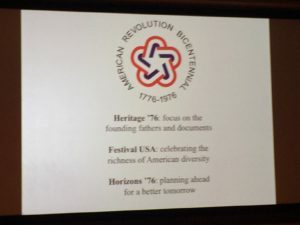 While nobody in my group would dare to set foot in a lecture hall on a football Saturday, I heard an awesome talk on how the Bicentennial was covered by TV in 1976. Awesome! The Notre Dame students are also ABSOLUTELY the best. 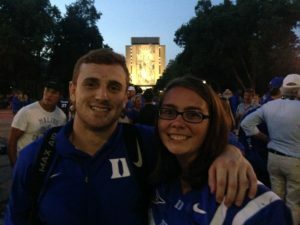 With LESS students overall then Duke, they had at least more than 20X the total number of kids in the building. After becoming accustomed to Duke students evacuating at halftime, it was fun to see students getting ‘pushed-up’ by their pals all through the student section after each Irish score. Duke students, you’re lame beyond belief. No other way to say it. 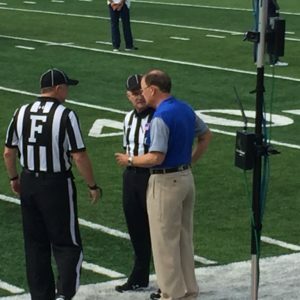 You’re missing a great show in Duke football. Coach Cut is a better coach than Chip Kelly. Cut’s always emphasized the importance of internal competition. It pushes everyone to be better, lets you play more people in a game so kids are fresh late in games, cushions you against the inevitable injuries that result, and just sends the message that everyone is equally accountable to each other for doing their best at all times. Examples of benefits of this approach are all over the place: Quay Chambers making a monster contribution at WR; Mike Ramsay and Edgar Cerenord pushing each other to be great on the interior of the D Line; Kane Banner contributing on special teams; Zach Boden with a big tackle on special teams; Tinashe Bere all over the field at LB; Jordan Hayes and others contributing in the secondary when Devon Edwards went down…. On and on. In contrast, after the loss, Chip Kelly says that NOW every position on his team is up for grabs. Really? Shout out to Jim Bridge and the Special Teams. We might get blown out if when down 14-0, Shaun Wilson doesn’t take one to the house. Kick ‘em when they’re down. Kudos to Zac Roper. After seeing us be the team that makes the mistakes and gets punished immediately for it, it was awesome to see us go right to the endzone for a score after their QB inexplicably dropped the ball deep in their own territory. 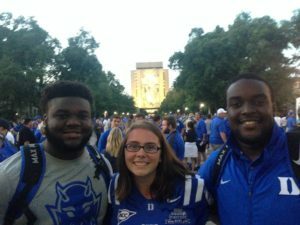 You can credit the different Duke team that showed up on Saturday to any number of things – maturing of a young team, regression to the mean (they were due), or luck of the Irish (thanks, Corbin McCarthy). 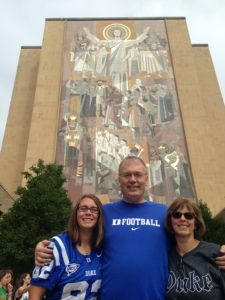 I put plenty of the fact that Sirk, a class act and genuine team leader, had recovered well enough to be on the sidelines in South Bend (on his birthday, even!). We won because of last year’s Miami debacle. We were robbed. No doubt about it. However, I’m convinced that Coach Cut didn’t personally let it go quickly enough, and that led to the wheels falling off the cart and subsequent losses to North Carolina, Pitt, and Virginia. This year, Cut’s also encountered some heavy adversity (losing to Wake and Northwestern in truly ugly ways), but Saturday suggests the staff dealt with it in a much more positive way. This is a bigger win for the program than the Pinstripe Bowl. Anyone else we can play from the state of Indiana? Purdue, maybe? 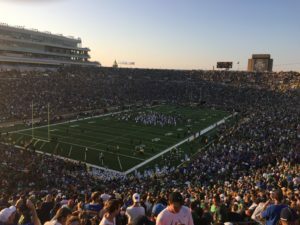 Winning in South Bend, on NBC, as a 21 point underdog, against a hungry and talented team that is THE legendary football program of all-time… it doesn’t get more significant than this, to be honest, at this point in the program. This team will ‘count to 6’. Saturday was clearly a pivot for the team and gives them back a shot at getting to six wins and a bowl game. This team can lose to anyone and beat anyone. With many more challenges to come (road games at Louisville, Pitt, Miami… really? ), this team will have more than a few more (mis) adventures this season, for sure. But that’s what is going to keep them being fascinating to watch and make reaching a bowl for the unprecedented 5th straight year perhaps the greatest accomplishment of them all. While there are a few constants (Hennessy at long snapper, Corbin McCarthy’s speed all over the defensive side of the ball), they are so much a work in progress. We’re seeing Zac Roper open up the playbook a bit (still needs to get more to the TEs, btw), as Daniel Jones and others blossom before our eyes. 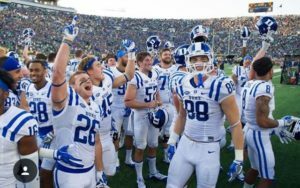 Plenty more excitement in Duke football in 2016. Go Duke!